I saw a picture of this kit in an old miniature catalog. It was made by a company in California that has long since gone out of business. I've so admired the house, that I decided to attempt to build it myself. I've often been asked for information on building the hacienda. I sketched out some plans that I hope will be helpful. The first thing I did was cut a board (39" x 25") that would serve as a base for the house. The base can be larger, if desired. I covered the board with wall paper that had a 3 dimensional stone pattern, but Paperclay would serve nicely for this purpose. I did not position the house on the board until it was almost completed. 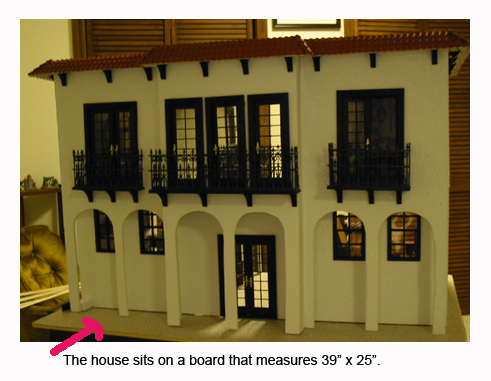 The house was built from 1/4" plywood, but 1/2" particle board would have been sturdier. 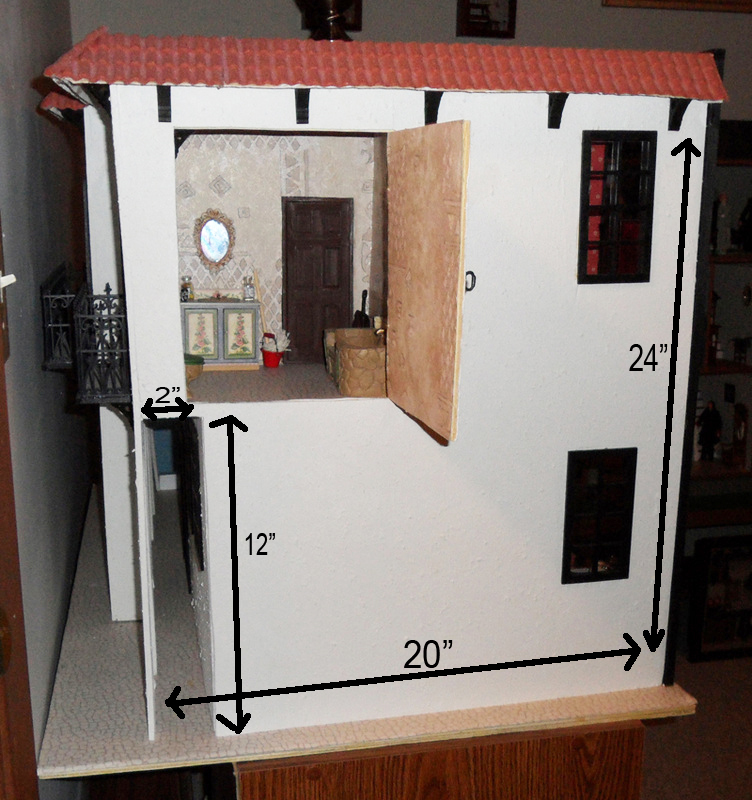 I made the house from poster board first, and found it very challenging to make modifications for the thickness of the wood compared to the poster board. The front of the house is composed of two pieces. 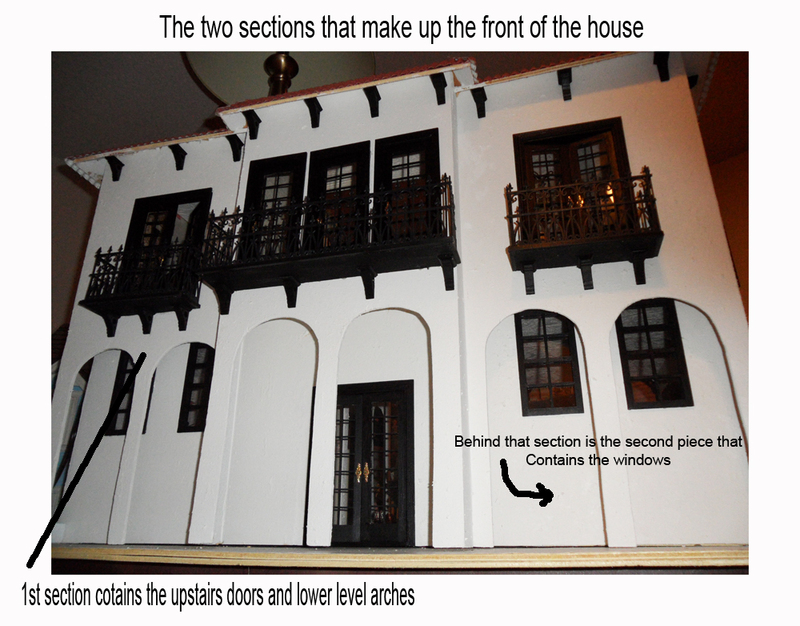 One piece contains the arches and the upstairs doors. The section that contains the lower level doos and windows sits behind this piece. 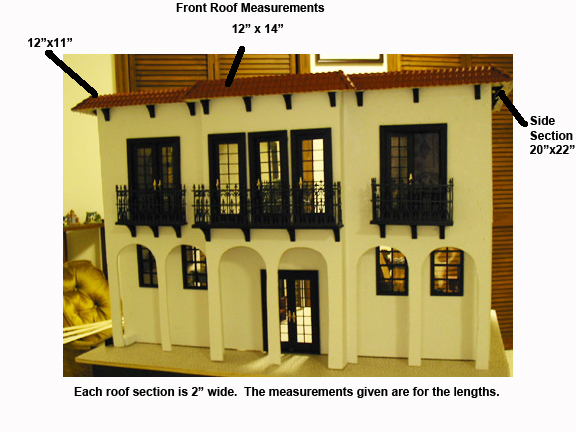 I purchased some trim pieces to position under the roof eaves. All windows in the Hacienda are 5 1/4 x 2 3/4. 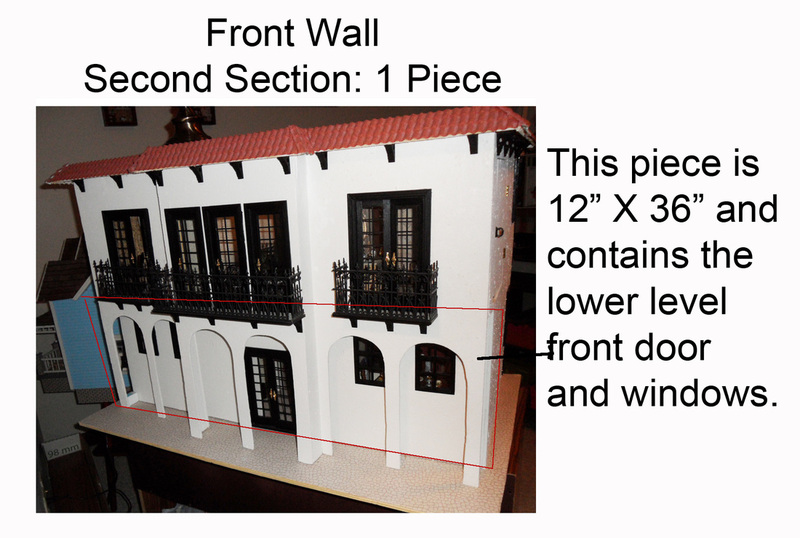 The windows start 2 1/2" from the edge of the wall and are 5 1/2" from the bottom of the piece. The door opening was cut 14 3/4" from the edge of the piece. 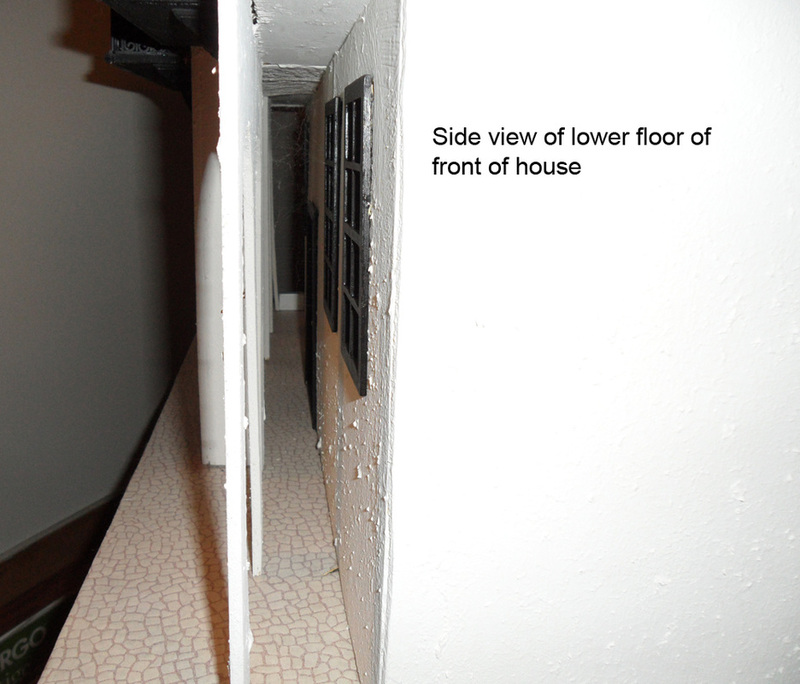 The side walls are exactly the same with the exception of a small opening on the left side (facing front of house) which contains an opening to the bathroom. 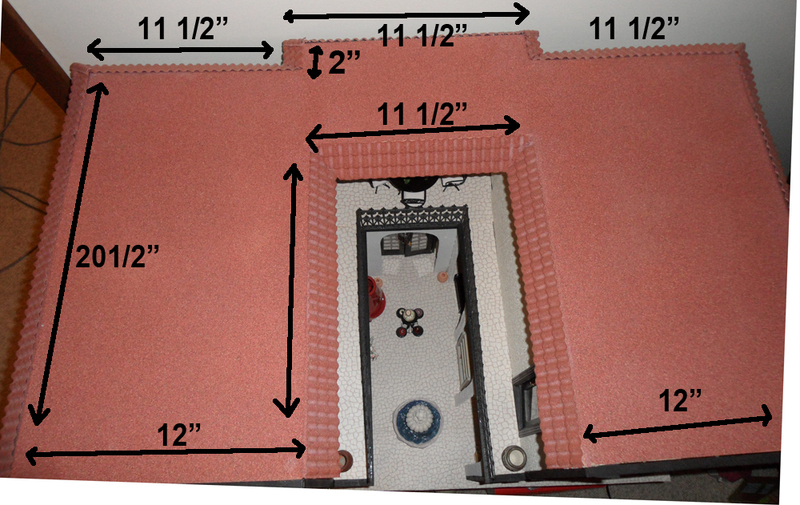 The opening for the bathroom is 7" wide by 9" high. The windows on the side are 5" from the bottom of the piece, 2" from the side and 2" from the top of the piece. The back of the house has a left and right sides. 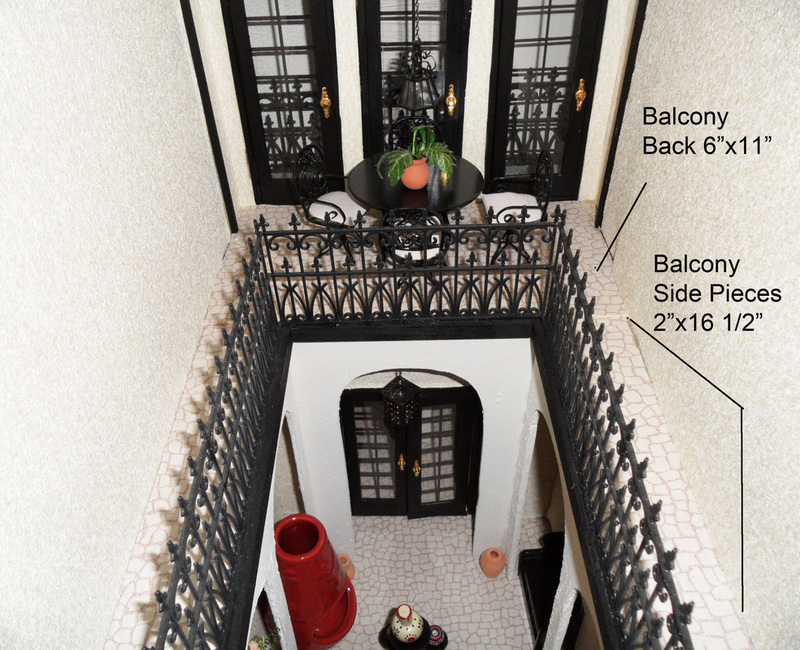 These sides are identical with the exception of a hallway and bathroom divider on the left side. There are two interior walls, 14" x 24". 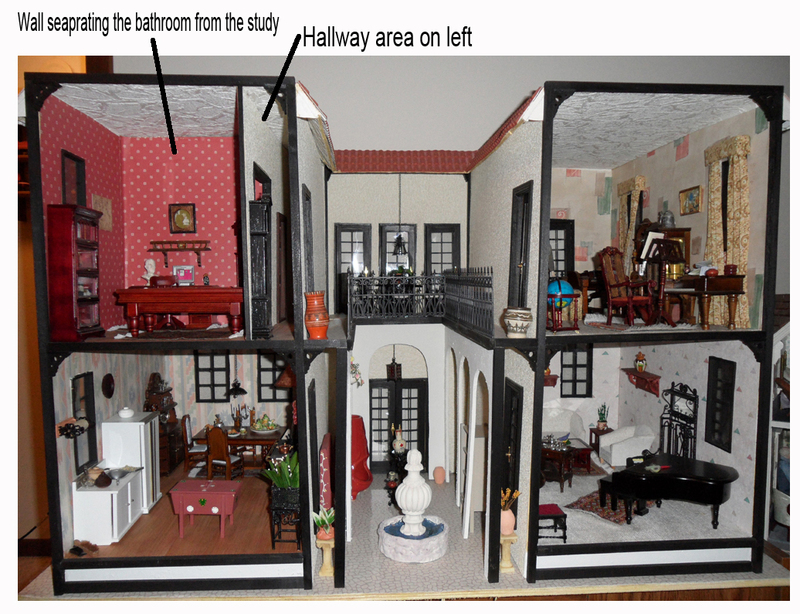 They are identical with the exception of the left wall which has a 5 1/2 inch opening into the study and a hallway door leading into the bathroom. 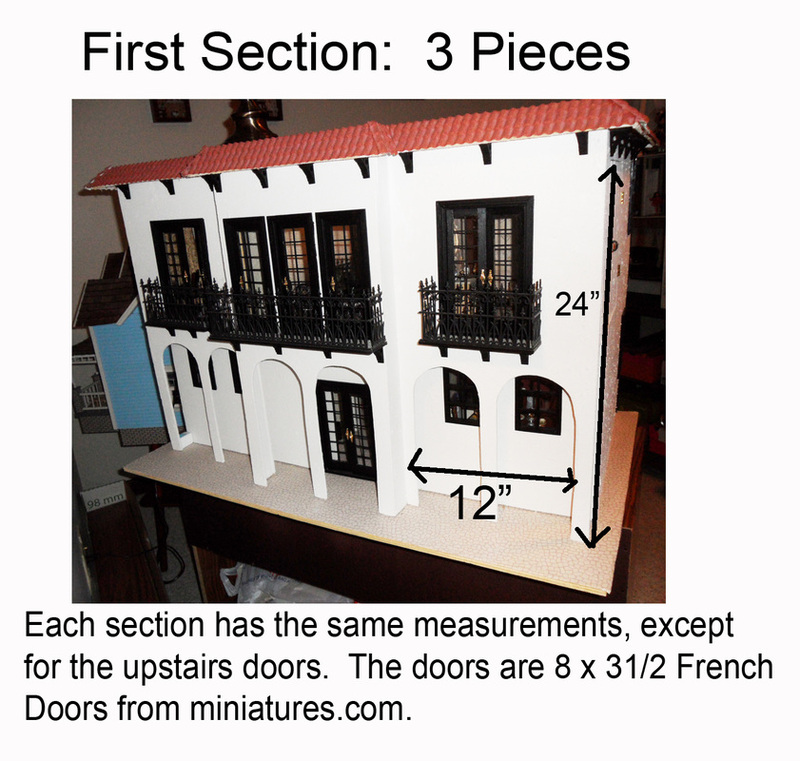 The second and floor measures 18" x 11 3/4" (cut four of these). 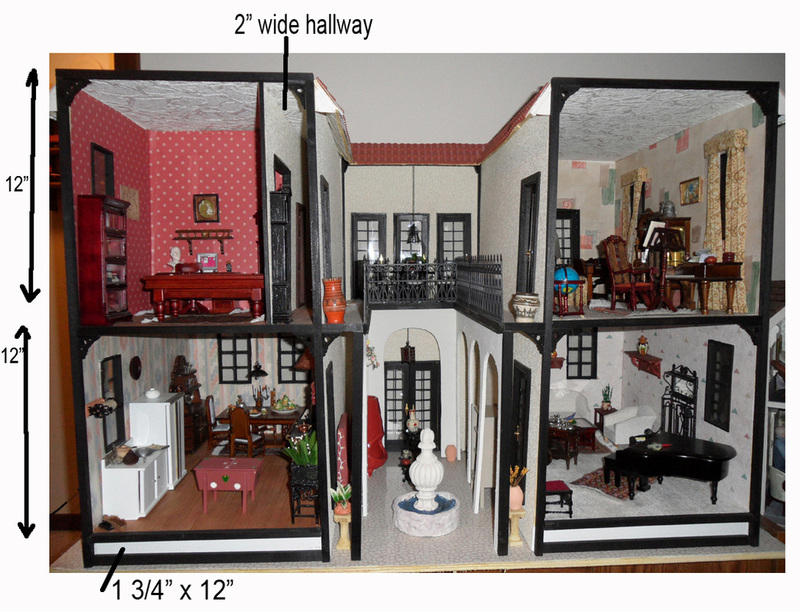 The lower floor sits on a base piece that measures 1 3/4" x 12" (cut 2 for each side of the house). 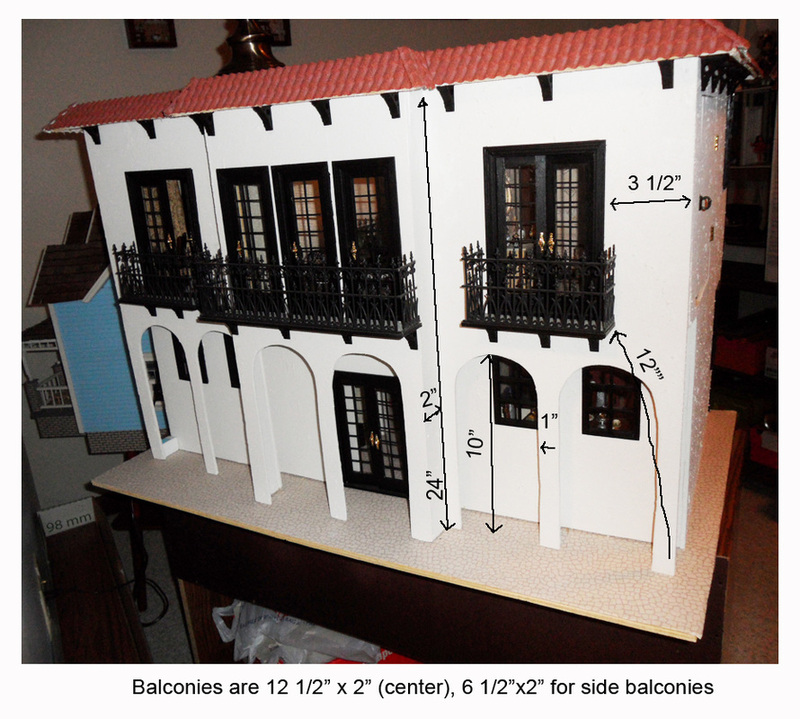 The interior walls are 14" x 24" (cut two). Doors are cut 2 1/4" from the side and 2" from the bottom of the piece. 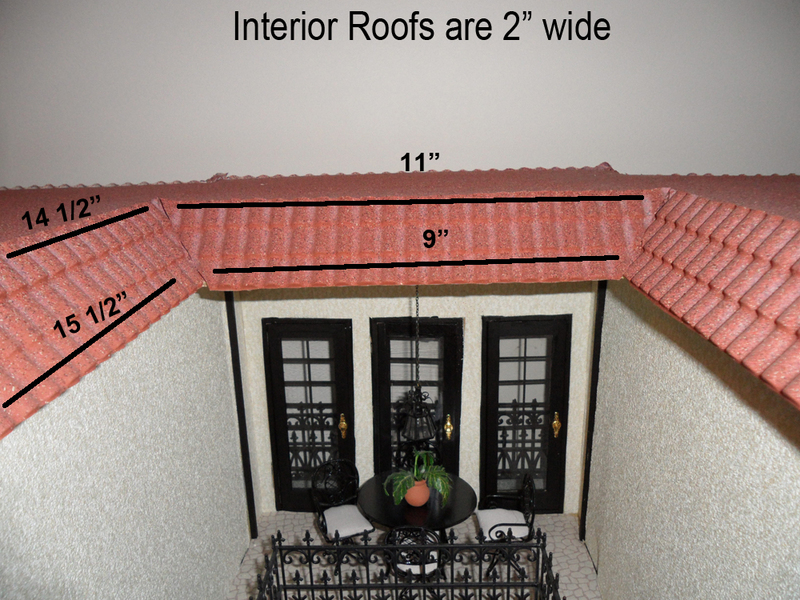 The inside patio arches are on a piece that measures 12"x16". 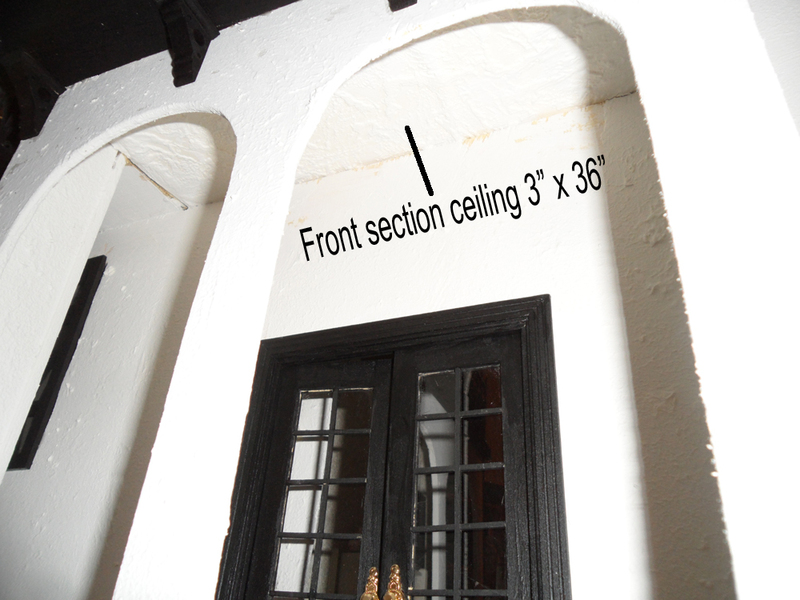 The arches are 1" wide and the arch opening is 10".